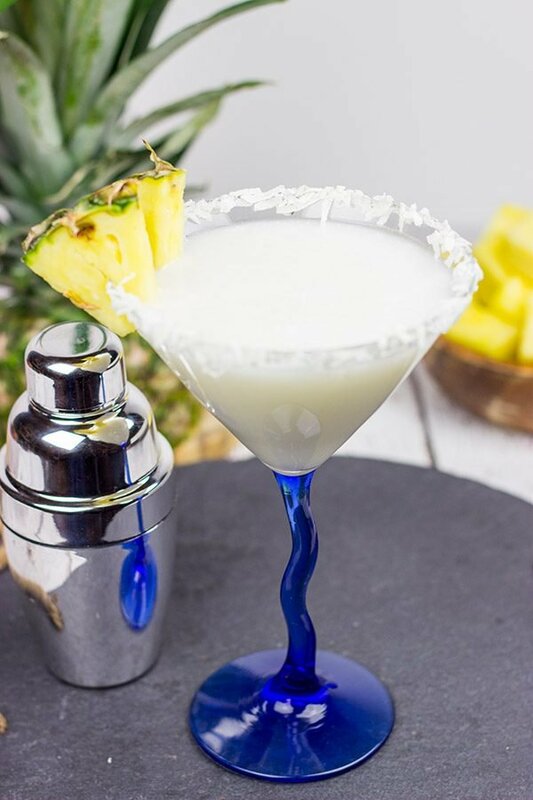 This Pineapple Coconut Martini is perfect for warm summer evenings on the back porch! Cheers! We’re going nuts here on the blog today…coco-nuts! I’m not a huge fan of coconut in my savory dishes, but I do love coconut desserts and coconut drinks. I’ve even seen a couple craft beer companies releasing coconut beers lately. I’m not sure how I feel about that one, but I’ll try anything once! Coconut cocktails are especially flavorful on a hot summer day. I mean if I close my eyes, I can almost imagine sitting by the beach on some tropical island. Almost. 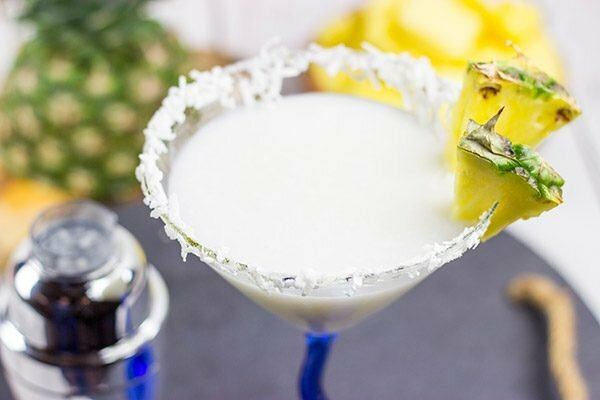 For this Pineapple Coconut Martini, coconut cream is my ingredient of choice. Have you ever used coconut cream as a mixer for cocktails? Typically, cocktails use cream of coconut instead of coconut cream. Wait…what? Coconut cream is different than cream of coconut? Yes, indeed it is…and (at least in my grocery store) it’s sold in an entirely different aisle. So what’s the difference? Coconut cream (that’s what I used for this Pineapple Coconut Martini) is a somewhat thick liquid that’s made from simmering 4 parts shredded coconut : 1 part water. Coconut cream is often found in cans near the Asian food section, and the first thing you’ll notice when you pop open that can is that it’s solid on top. Just grab a spoon and stir the solids in with the liquid at the bottom. You’ll be left with a thick, milky white liquid that’s packed with coconut flavor. Ok, so what’s cream of coconut then? Cream of coconut is very similar to coconut cream, but it includes added sugar. I use cream of coconut whenever I make a batch of my classic piña coladas. 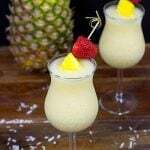 After all, piña coladas are meant to be a sweeter drink. However, in general, I’m not a big fan of sweet drinks. Since I didn’t want this Pineapple Coconut Martini to be too sweet, I opted for coconut cream. (If you like your drinks sweeter, then grab a can of cream of coconut instead.) Keep in mind that the pineapple juice brings a bit of sweetness to the finished drink. 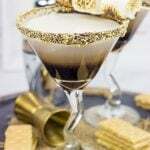 Much like this S’mores Martini that I made a few weeks ago, this Pineapple Coconut Martini isn’t a martini at all. It’s definitely more of a cocktail, and I could’ve served this one in highball glasses. But the martini glass just looks cool here. Plus, fun drinks are all about presentation, right? I dipped the rims of the glasses in a bit of simple syrup and then coated ’em with shredded coconut. The garnished rim is an easy way to add a summery vibe to these drinks! So grab a fresh pineapple and a can of coconut cream. Whisk up a Pineapple Coconut Martini and grab a seat outside on the back porch. Oh, and these martinis taste better with friends. It’s a proven fact! Cheers! Using a cocktail shaker filled with ice, add all ingredients for martinis (vodka, coconut rum, pineapple juice and coconut cream); shake well. Using a paper towel dipped in simple syrup, brush the rims of 2 martini glasses with simple syrup. Roll the dipped portion of the glasses in the shredded coconut. 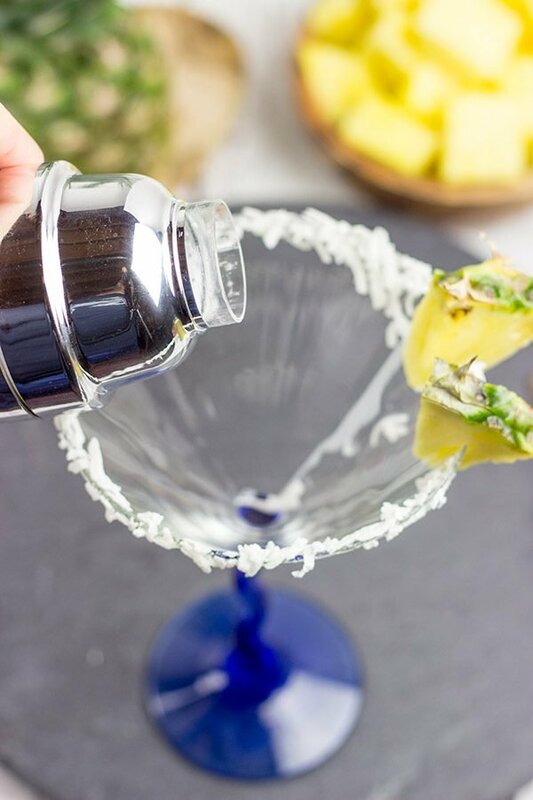 Fill martini glasses and garnish with a slice of pineapple before serving. To make simple syrup, combine 1 cup of water with 1 cup of sugar. Place mixture over medium heat and simmer until sugar has dissolved, approximately 5 minutes. Let cool before using. Simple syrup can be stored in an airtight container in the refrigerator for 3-4 weeks. Coconut cream is often sold in the Asian section of the grocery store. It is similar to cream of coconut, but it doesn't include additional sugar. If you prefer sweeter drinks, then just grab a can of cream of coconut instead. I’m not certain I’ll be able to keep straight the difference between cream of coconut and coconut cream, but if I remember to look in the Asian isle, I should be good! This looks like a delicious and fun summer drink! Love the coconut rim! Hahaha! 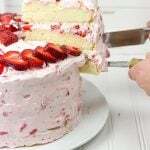 I’m working on a coconut cake recipe so I just wrote up a very similar explanation of coconut cream versus cream of coconut–except I use cream of coconut because my cake is uber-sweet. I love that this martini is less sweet though; sweet beverages are so not my thing! Pineapple and coconut most definitely are my thing though–yum! Glad to know the difference between those two. Coconut is the main theme for summer here. 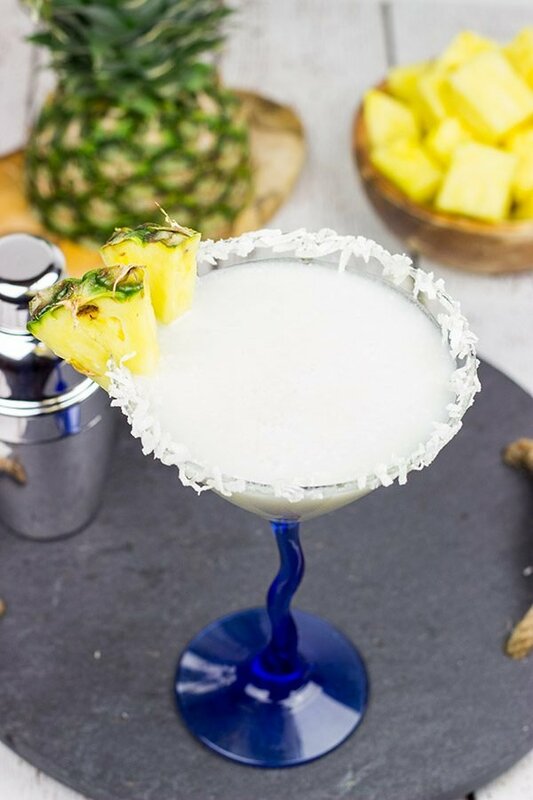 And this pineapple coconut martini is a perfect way to create a summer tropical theme at home. Hi, I have been on a long vacation(more than I had expected) and hence missed out on a lot of your recipes. Glad I am back reading them. Puja! Welcome back, my friend. I was just thinking about you the other day. I can’t remember what made me think about you, but I was driving around, and I was like “I wonder how Puja is doing?” Either way, I’m glad you’re back! Oh my this sounds yummy. I’d probably have to add some spritz of some sort – I just can’t drink strong drinks. Plus I’m more of a wino anyway but coconut and pineapple certainly can’t be beat. 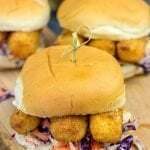 Did you ever catch my coconut Willy on the blog? Discovered it in Hawaii, and now it’s our friends’ favorite summer drink. Very good, but not martini-strong. You know, I think a spritz would totally work in this drink! I feel like this is a good sippin’ drink on the backporch, but I can get behind adding a spritz. And like you, I do love a good tropical themed drink…especially in the summer. Normally I go to whiskey, beer or wine, but every once in a while it’s fun to mix it up a bit! I don’t recall that Coconut Willy, but I’m going to go find it right now. Thanks, Mimi! Hmmm…no porch? Maybe you could just open the windows and put 2 chairs out? You can pretend you’re sitting on the porch that way! 🙂 And the difference between coconut cream and cream of coconut is enough to make your eyes go crossed, but it’s good stuff to know! Hope you had a great weekend, my friend! 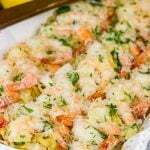 Oooh yum, this just screams summer! And an island getaway! When I was in Hawaii a few weeks ago I really wanted a drink in an actual pineapple or coconut but never wound up finding/ordering one. And now I’m craving pineapple! Oh no! I’ve always wanted to try a drink in a pineapple or coconut, too. Maybe we can just recreate it back home? Hey, if they can do it in a bar, then we can do it at home, right? 🙂 Thanks so much, Nicole! This lovely cocktail makes me want to throw a luau!! 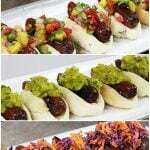 Amazing flavors and so festive!! Yes! Any excuse to throw a summer party is good by me. 🙂 Thanks so much, Marissa! Haha…tell me about it, Frank! The difference between coconut cream and cream of coconut is enough to make your eyes go crossed, but it’s good stuff to keep in mind. But for now, let’s work on finding that tropical beach…or at least the back yard. 🙂 Hope you had a great weekend, my friend! I love the flavor of coconut. 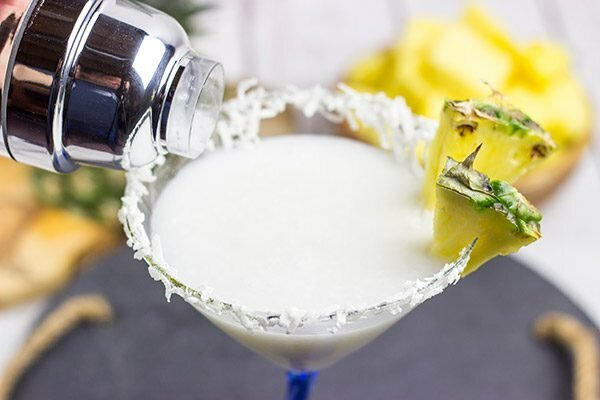 I need to try this pineapple coconut martini! You have a taste of the tropics here, David! 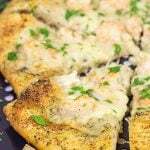 What a delicious concoction AND so pretty to look at too – but wait…am thinking I read this line “I’m not a huge fan of coconut in my savory dishes” wrong… you meant to say “I AM a huge fan of coconut in my savory dishes” correct? 🙂 IMO coconut milk (full fat -it does have a similar thing going with the hardening of the coconut on the top as does coconut cream) pairs so beautifully with tomato paste and a plethora of spices in all sorts of curries… I’ll send some over via drone?